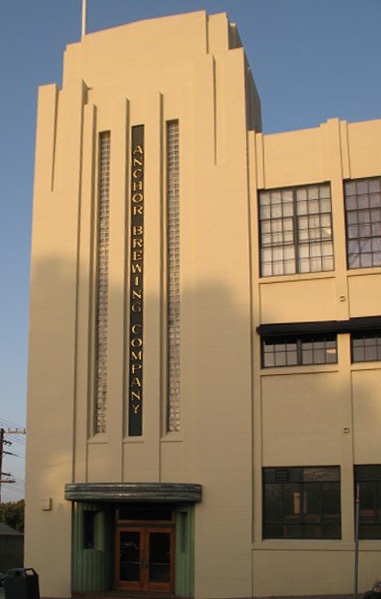 Anchor Brewery, makers of the well-known Anchor Steam Beer, Liberty Ale, Old Foghorn, Brekles Brown and other traditional beers and ales, do not have their own pub. However, the brewery offers free tours by reservation every weekday and “happy hour tours on weekends. These include tastings of a selection of their beers. Some of these beers can be almost impossible to find on draft outside the brewery. The rub is that these small tours are quite popular. One to three months in advance is a suggested lead time. The tour of the unusual antique production brewery and the included tastings last about 2 hours and are well worth it. Anchor was one of many local San Francisco brands a century ago, in the days before the national corporate giants, but was the only one to survive. Anchor rescued an original American style, the California “Steam” or Common beer in the process. Their interesting website and unusual tours tell the story of how this brewery helped pave the way for the modern beer renaissance, and supported the rise of the contemporary homebrewer. Extras: You can rent their space for your special event, including a brewery tour and private tasting. You can also get growler fills at the brewery seven days a week. Nearby, at the local Whole Foods is a cafe called Steep Brews that almost always has fresh Anchor beers on draft, if you happen by the brewery without reservations and get thirsty at the sight. Official 16th St. Station and connecting transit info.